If you held on to the the card of the gentleman we met in the Chapultepec Park, who was in charge of the book stall in the contemplation corner, I would appreciate you sending me his contact information (name, phone and e-mail), as I may be in a position to donate some books to his operation. If your travels happen to bring you back to Charlottesville Virginia in the next few months, I should be in town and would be pleased to be YOUR host! I truly appreciate all the work and planning that must go into your "guided tour hashes" each week, and as a long-time hasher, all I can say, with respect and amazement is well done and ON ON!!! At 9:30am on Sunday morning we left our apartment in Condesa and cycled to Casa Cholita, arriving there by 10am. Little did we know how much cycling we were going to be doing that day…… Bulk Mail (aka Froggie) met us and told us the history of Casa Cholita and the hash in Mexico City. He also told us his marvelous story about his relationship to the frog as a talisman. After running past the Monument to WWII soldiers we had a brief respite in the meditation garden and then the real work begun. BM, aka Froggie led the march up the hill to Chapultepec Castle and then back down again, we ran across the park taking in sights such as Los Pinos, the zoo, several large ponds, and an amusement park. After two hours on the run we stopped for a much needed fruit juice and some shade. Refreshed by our rest the jogging continued, albeit a little slower, through the park, around a lake, across some walk ways over large roads, and at times on the large roads (a little scary) until we came to the memorial for victims of the 2008 plane crash. After a short pause we continued our run up Reforma for a while. Just as I thought I could run no more, we came upon more bicycles and continued our journey. weaving and ducking in and out between pedestrians, cars, buses and other cyclists I tried in vain to keep up. I must say I think I lost BM Froggie at least eight times during that cycle into the downtown area and around the historical center of the city. Finally, after about an hour cycling, and breathing in all sorts of exhaust fumes, Bulk Mail called a halt and led us to El Horreo, a lovely cantina with lots of bull fighting memorabilia. It was a very welcome end to over four hours of running and cycling (and a bit of walking too). We enjoyed a wonderful meal, great conversation and quite a few beers, plus the odd tequila. It was a very invigorating day, taking in many sights of Mexico City and learning a lot more about the city we are now learning to call home. To say we felt a bit sore the next day would be an .. understatement! Our deepest gratitude to Bulk Mail for his willingness to share his expertise and teeming local knowledge, though it was not a large group of hashers, it was our favorite hash experience thus far. Chris is a former USAF Officer, currently working for Huawei, a high tech Chinese company, in marketing in Mexico City. AKA Dude Where's My Trail has hashed in Taipei and Beijing before. Amber is a former Hermanita in Casa Cholita She owns an editorial company based out of San Antonio, Texas, is a psychologist & former specialist in treatment of Young Criminal Offenders, San Antonio City Municipal Government, Court System in Texas. Currently residing in Cholula, Pue., Mexico. Nuestro relator es Miguel Ángel Pérez Gómez, mejor conocido como "Mike", quien es estudiante de la Facultad de Medicina, UNAM. Solo Mike es Hasher de Hueso Colorado de la Ciudad de México. Mike confiesa prefiere le llamemos Mike, pues "Miguel Angel" es su nombre cuando su mamá está :) enojada. On Sunday morning, a small group of hashers left the meeting point and walked to the subway: Froggie Mario, Just Lupita, Nancy, Nick and Dude Where’s my Trail. In a few short minutes, we were at the subway. Next, we took a train and eventually came to the bus station. Frog Mario suffers from a mysterious affliction which he needs gloves to correct (we’re curious about the affect this has when he’s preparing to sweat in some certain situations?). From there, we went straight along the main street of San Pedro Tultepec, just outside Toluca. The street featured lots of furniture shops. It was still pretty early on a Sunday morning, so the street was lined with big dogs lazing around all over the place. We saw a chair that was shaped like a giant hand (Did your mind just go there? Ours, too. ), and a race car bed which is something Nick said he’s been needing badly. Soon, master carpenter Don Leopoldo stopped by in his pickup truck, and we were all able to squeeze in and travel to his beautiful house where we spent a few minutes in the courtyard that features lots of grass and flowers, fountains with fish, and a live alligator chilling out around the side (No lie. A real alligator!). There was an ancient German shepherd pacing in the back. I guess he didn’t get the memo about lying down on Sunday morning. Gotta admire that German work ethic. Now, with the hash count increased by double, we drove three trucks up a little road that goes to the start point. Mario convened the circle, and we did introductions. The hash rules part was pretty short… maybe because there was no trail marked? Serious runner Nick took the lead, and we began up the paved road towards the forest area. The road quickly turned to dirt, and except for a few BMC trail riders, the place was empty. Just Lupita was the photographer and was also kind enough to fire up some wild Mexican dance music on the way. I’m sure her phone had many reptiles twerking on the trail. city of Toluca appeared below. We were surrounded by bushes covered with fragrant purple flowers, and Don Leopoldo’s compadres told us we’d be descending into a big pisto, which I guess is a deep ravine of some sort. Instead, Frog Mario was turning purple from lack of sweat, so we just did a short out and back, which was probably a relief for the hashers in jeans and cowboy boots. About halfway down, we had the circle on the side of the road right next to a house run by some friendly Mexican moonshiners. The party had already started when we got back, and more big clay cups were immediately filled with pulque (“nectar of the gods”), a white/yellowish drink made from the agave (maguey) cactus. Like champagne, you won’t know how wasted you are until it’s too late. Apart from this, it’s pretty hard to see any other resemblance to champagne. It was good – not sweet, not too strong, and very nutritious tasting. Those of us who had no idea you could even make moonshine from cactus were pleasantly surprised. There was a general lack of hash song preparation in the circle, which I’m sure will be corrected next week (that means you, Nick). Mario and Just Lupita kept things going, and I can still hear Lupita’s lovely rendition of “Aaaaaaai, Yai, Yai Yai….opps, forgot the rest”. Dude Where’s my Trail taught everyone a few words in Chinese, then he and Nick proceeded to gulp down an entire mug of the desert flower juice. We buggered off to a fantastic open 1-room outdoor restaurant on the side of a steep trail. More pulque appeared, followed by a dozen different types of hot, delicious tacos flowing from the stove area. Nick and Nancy were after the delicious coffee, and it seemed like there was nothing this restaurant couldn’t provide. The skies opened up for the first time while we were eating, and the rain on the plastic roof, combined short speeches from everyone, made it a perfect late lunch. After lunch, we jumped back in the truck and, after a confusing start from the bus station, all 5 hashers arrived back in the city uneventfully, with a 5-gallon water jug partially filled with pulque in hand. If you stop by Hooters with your family (it’s a family restaurant, BTW), be sure and ask if there’s any on the menu. Looking forward to next Saturday’s big event, and whatever other moonshine variants can be found. Holy Hash House Harriers booze cruise, Batman! Joining the gang at Casa Cholita this week were Juan Carlos, investigative journalist extraordinaire, and the lovely Flor Arianna. Nancy located her running shoes this week, and we were all impressed by her runner’s determination. We headed to the subway station with a couple of very heavy packs on wheels (beer and pulque – and ice! what else…), then took the train south to the very last stop. We passed the Aztec stadium along the way, and soon it was clear we were no longer in the city. We got off, took a couple of cabs, then there we were at THE finest funfest in Mexico City –Xochimilco! boozin’ and cruisin’. There are fleets of these crazy colorful gondola-like boats called trajineras. The job of these boats is to take initially sober Mexican families and friends down around the 170 km of canals and get them completely wasted while having a lot of fun along the way. You can imagine the kind of beer you could put away on a booze cruise like that! This hash certainly didn’t disappoint. We got to the park right on time, and were pretty much alone. After hanging around with Alfred, the boat catering dude and his wife at the tourist office, Mario got sick of waiting for runners to materialize. We got the circle going right at 11, and a few minutes later some walkers and 6 (count ‘em!) runners hit the trail. Jogging around the park in the hot summer sun was really awesome. We came across tons of cool areas. On one stretch, we invaded a few greenhouse shops to check out what was going on back there. They had flowers and plants that defy all description. We also came across a long dirt road with dozens of horses to rent. They came in all sizes and colors – full plowhorse size for the manly men, and little tiny Shetland Pony-sized horses for the kiddies. Soon, it was circle time. Mario prepared a red rose for the very nice tourism official, and she gave us the rundown on the park, its history, and what’s going on with erosion and efforts to preserve the park – well worth the sunburn we endured from standing in the sun during her speech. Also, she gave us all cool posters of the park (suitable for framing, only there’s no space left on Mario’s walls with all the frog paintings). Then it was time for the hash ceremony, some songs, toasting the long time no see-ums, and strangely, toasting the two Americans (For being American? Um, okay. USA! USA!). The pulque was flowing and cold beer was in abundance. Without further waiting (somehow the group had expanded to like 25 people by this time…where were all those guys when it was time to mark the trail? ), we made our way down to the boat landing. The canal was getting busy, and it was a little while before we could get out onto open water. So, our gondola dudes played bumper boats to amuse themselves. Drinking, drinking, drinking, and then a bunch of open water. Then lots of boats filled with families and friends, singing, eating laughing. Then the hashers, eating, drinking, singing…man, it was the best. Arnold Schwarzenegger, showed up sober, and the situation was quickly rectified. Your writer, Dude Where’s My Trail, was lit up like a Christmas tree by this time, but he does recall witnessing a pretty cool folk ritual as we were walking to the front: the voladores. Four guys in traditional dress climbed all the way to the top of this very high steel pole, where they had little perches they could balance on. They proceeded to carefully wind some heavy rope for several feet around the tip of the pole, really tightly. After the winding, they attached the rope around their waist, shook hands, leaned back and dropped off the pole backwards. Then it was this cool swing, where the rope unwound and they gently hung by their legs upside down until they reached the ground. Subway. Hey, it must have all worked out…), and we can’t wait for another hash and booze cruise around the canals of Xochimilco – On on! Well, what can we say…another remarkable hash weekend, replete with winged birds, winged frogs, collegiate dogs, bicycle wrecks and best of all… cold beer (which just so happened to have the name of my former co-worker on it. Leon, are you reading?)! Full-on Sunday morning pancake manufacturing operation on the roof top of the chalet named Casa Cholita – right in the inner sanctum of Security Corner. Lupita was sweating over a hot stove; Mario was pretending to be busy; and the American contingent was conveniently out of sight. The house is impressive. Roof-top hangouts mixed with unopened bottles of mysterious liquids - a man town fit for any gentleman of froggish inclination. There were stairs that descend directly into wet laundry on hangers and a small zoo featuring a parrot sitting attentively, ignoring his silly canary neighbors. It was awesome. only one of the bicycles had a flat. So naturally, Mario and Dude Where’s my Trail did the honorable thing – allowing Lupita to run with the bike all the way to the gas station. As we launched the expedition, veteran hasher Frog gave Dude Where’s My Trail his serious voice. The three pedaled like hell in tight formation south to Universidad Autónoma de México (UNAM). There, our group expanded by four: Mario (who – rumor has it – shares a name with a certain amphibian), Alfredo, Gonzalo, and Mike. We saw joggers and in-line skaters, many many dogs of every breed, plus a jet-black squirrel climbing the entrance of the Science building. Alfredo’s bike lock, which expands to lock any number of bicycles, wasn’t working. Somebody said, “Hey, we’re physics majors: we can make this work!” About two minutes later, Frog-in-Chief, Lupita and Alfredo began riding the bikes while a core group of young scholars plus one American guy began hashing around the perimeter. Nancy and the Hooter’s Girls would be arriving soon! Unfortunately, this wasn’t quite the case. In reality, the question presented was Mario’s cruel way of asking if we wanted to experience the long downhill stretch at race pace… sheesh. By the way, there’s such a thing on the hash as a ‘trail’ – eh? – just for future reference. We met up in front of the Fine Arts building, and after a quick dip in the fountain Alfredo gave us the low-down: turns out UNAM isn’t located in Saigon at all. Actually, it’s right here in Mexico City! And like almost everything else here, God built the place and then transferred ownership over to some mortals. Today it’s the best school in the whole of Latin America (!). And in fact, there is some amazing brain power on display; all dogs, we say? Boy were they smart! And I hear the humans are considering a public bathroom to help the hundreds of visitors every weekend during the summer. So clearly, the level of intellectual activity is high. smash into his rear tire and break a headlight. Minor damage, nobody was hurt, but you have to wonder…what was running through his amphibian mind? I think I know the reason: someone called out “free beer”! Lulu from the US Embassy (sorry, Lulu!) and woman of obvious means (Miami Luv aka Maru), came and helped us reduce the bar’s beer inventory. The food and beer were so fantastic, we flew back to Casa Cholita in no time, where the hardworking Amber had finished work and was kind enough to reunite some tourist mementos to their grateful owners. Man! Hashing on a hot, sunny day: excellent beer, delicious food, and good conversation? On on! Llegando a CASA CHOLITA en compañía de Bulk Mail nos preguntamos si Don Mario y Lupita ya se habían ido, oh no! 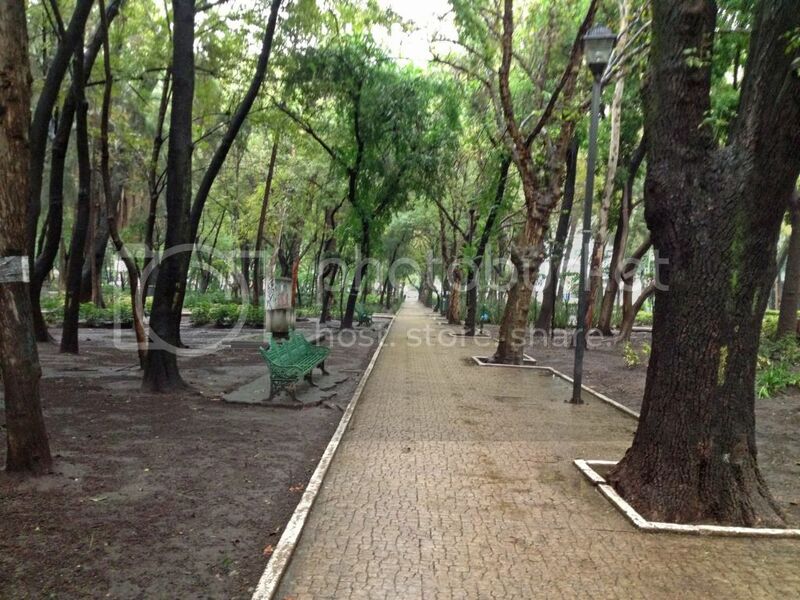 Ahora tendría que correr con super Mario (profesor de la Facultad de Ciencias de la UNAM y .. maratonista) hacia Chapultepec, pero de inmediato Sólo Lupita nos abrió las puertas de Casa Cholita, uff! De la que me salve! Jajaja… Casa Cholita nos recibió de una forma muy calurosa de tal forma que me sentí en mi propia casa, llena de alegría, comodidad y color, ah y se me olvidaba, ranas y ranas por todos lados. Pronto llegó la nueva inquilina, nuestra nueva hasher se llama Fabiola, viene de Villahermosa Tabasco y estará un buen tiempo por aquí para estudiar la carrera de Comercio y Negocios Internacionales en la EBC (Escuela Bancaria y Comercial), venía acompañada de su mamá la Sra. Gema. Enseguida llegaron hicimos la tradicional presentación e introducción al grupo, para después salir rumbo al bosque de Chapultepec. Mario, Lupita, Fabiola y Gema iban en bicicleta y Super Mario y yo escogimos el camino difícil, irnos corriendo. que fue nuestra siguiente parada, uno de los objetos más emblemáticos de este parque es su fuente, la cual es considera un símbolo de amor al ser visitada por cientos de parejas al momento de casarse. Cambiando de tema y haciendo referencia a la imagen de arriba, han notado como hay intervalos de tiempo en los que Mario corre al estilo zombie jejeje…. Lamentablemente Gema nos tuvo que abandonar apenas empezamos el recorrido por Reforma, pero eso nos permitiría torturar a Fabiola con toda la libertad del mundo. Recorrimos Avenida Reforma rumbo al Auditorio Nacional, sede de muy importantes eventos pero más famoso porque ahí se han presentado cantantes y grupos famosos, llegando a Periférico Fabiola y yo ya estábamos lo que le sigue de cansados pero Mario como siempre estaba a todo lo que daba, por ello decidimos pararnos un momento en la intersección de Reforma con el circuito Periférico, mientras escuchábamos una breve semblanza histórica sobre la ubicación de dicho punto y sobre la Fuente de Petróleos, personalmente creo que este es uno de los puntos más hermosos de la ciudad porque tienes una vista panorámica de la enorme inmensidad del bosque de Chapultepec y algunos de los edificios corporativos aledaños a la zona. 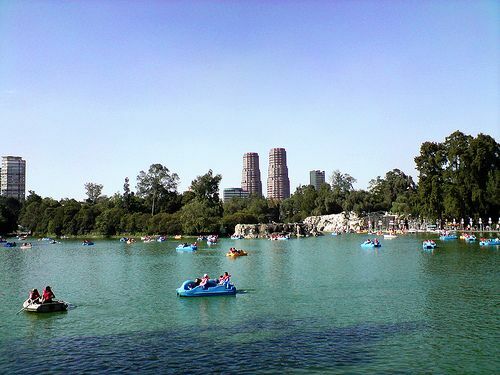 de Chapultepec, conocido popularmente como la alberca para perros más grande del mundo.